Photo: William G. Raines House, ca. 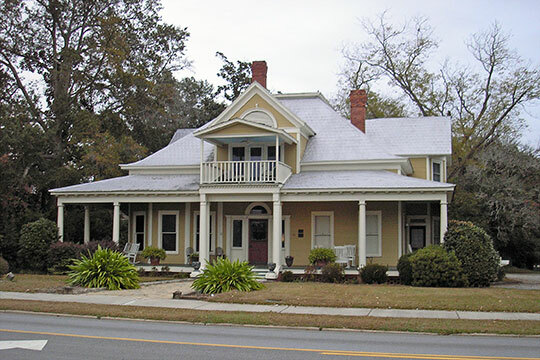 1904, 106 South Main Street, Statesboro, GA. The Historic District was listed on the National Register of Historic Places in 1987. Photographed by user:Blastoids (own work), 2013, [cc-by-3.0 (creativecommons.org/licenses/by/3.0)], via Wikimedia Commons, accessed February, 2016. Bulloch County administrative offices are located at 115 North Main Street, Statesboro, GA 30458; phone: 912-764-6245. Bulloch County is bounded by rivers on the east and west — the Ogeechee River and Canoochee River, respectively.